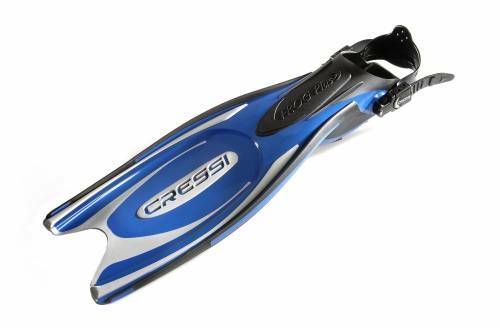 A flap of novel conception in materials and design but enjoying the unique characteristics of diving fins Cressi maintaining the spirit of the legendary Frog. Frog Plus is made of a new polypropylene variant móduloque low, coupled with a particular structure it combines great flexibility, softness and resistance to demanding use (even as fin rental and school in a dive center), durability and unreleased aesthetic fins projected with this philosophy. Frog Plus is the real 4x4 of Mares fins. 1. Main body of polypropylene: This material inherited from fins apnea, its main characteristic is the very rapid transfer of applied energy and high structural rigidity. It is applied to the upper and inner part of the sole of the sandwich. He is very nervous and reactive and provides an agile and effective flutter. It has a stress-performance clearly superior to traditional materials (natural or thermoplastic rubber, polyurethane, EVA) relationship. 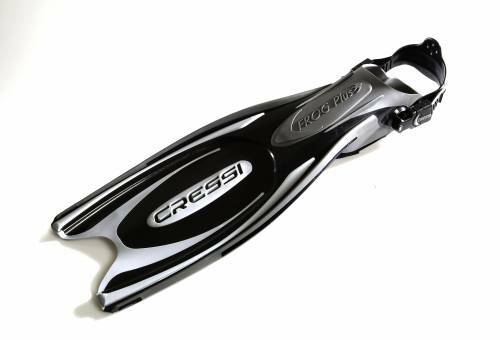 It also has a high resistance to breakage to the extent that Cressi guarantees the lifetime for sports. 2. Flexible Elastomer: Applies to the foot pocket and areas that require flexibility and elasticity, as they influence the comfort of the diver: toe of the shoe, insole and instep area in contact with the ankle. The merger of the two materials is done at the molecular level and its strength is guaranteed for life for sports. Design "under the blade foot pocket": The blade comes directly from the top of the shoe, firmly attaching the fin to foot and transmitting all the effort generated by flapping without energy losses through soft areas. This format allows channel water from the same ankle to the trailing edge of the blade, unlike traditional models, in which the foot pocket has no input on progress. Besides improving the directionality of flapping, this design provides a performance between 10% and 15% higher than would correspond to the fin blade surface. Blade thickness decreasing profile to improve the directionality of the flapping and achieve greater inertia of the end of the fin. Footpocket reinforced at the top by an additional thickness and laterally by two extensions of polypropylene from the blade to prevent the spread of energy in the process of transmission of the foot to the blade. His three volumes over fit the foot comfortably but firmly optimizing the use of effort. Rotating buckles 360, with insertion bayonet foot pocket which prevents accidental loss of the female part. Optional spring strips (AISI 316) with identical to the standard version buckles but reinforced with stainless steel pin are available. Colours: Black-gray, black-yellow, blue-gray, black-pink.